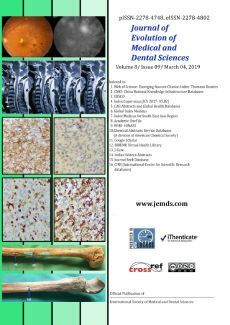 EFFECT OF E-GLASS FIBER ADDITION ON MECHANICAL PROPERTIES OF HEAT-POLYMERIZED ACRYLIC RESIN DENTURE BASE. PATTERN OF SUBSTANCE USE IN A DRUG DEADDICTION CENTRE IN DIPHU- NORTHEAST INDIA-BASED STUDY. EVALUATION OF APACHE- IV & SAPS- II SCORING SYSTEMS AND CALCULATION OF STANDARDISED MORTALITY RATE IN SEVERE SEPSIS AND SEPTIC SHOCK PATIENTS- A PROSPECTIVE OBSERVATIONAL STUDY. PROSPECTIVE STUDY OF ASSESSMENT OF BODY IRON STORES IN EXCLUSIVELY BREAST-FED INFANTS DURING FIRST SIX MONTHS OF LIFE. A RANDOMIZED COMPARATIVE STUDY TO ASSESS THE EFFECT OF INTRATHECAL NALBUPHINE VERSUS INTRATHECAL FENTANYL AS ADJUVANT TO BUPIVACAINE FOR LOWER LIMB ORTHOPAEDIC SURGERY. Your article in JEMDS is now preserved by CLOCKSS. All Articles submitted to JEMDS are Checked for Plagiarism with ithenticate.